These 6500C3 CT high-speed reels are the upgraded versions of the world famous Mag Elite. 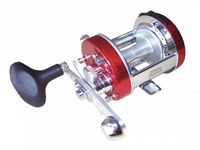 With a high-speed retrieve ratio, six-pin centrifugal brake, mag brake system, crowned Durabrass gears and Carbon Matrix drag, these reels cast out as quickly as they retrieve!  Crowned Gears  creates smoother gearing.  6-Pin Centrifugal Brake  possible to have 0-6.  99% Carbon Matrix Drag - 30%+ improvement.  Easy access magnetic brake.  New improved V-shape spool.  Brake blocks engaged. Better feel in all fishing situations.